'Vices of the most revolting nature' is a coded reference to homosexuality. It was recommended that in future, all prisons be built according to the ‘separation’ system, in which prisoners were kept in individual cells and different classes of prisoners used different yards. Boggo Road Gaol was built with this in mind, and as such was Queensland’s first purpose-built modern prison for women. The first prison built according to the separate system was the Eastern State Penitentiary in 1829 in Philadelphia, Pennsylvania in theUnited States. Its design was later copied by more than 300 prisons worldwide. Its revolutionary system of incarceration, dubbed the "Pennsylvania System" or separate system, originated and encouraged separation of inmates from one another as a form of rehabilitation. The spaces between the prison blocks and the prison wall are used as exercise yards. When the separate system was first introduced, prisoners were required to be in solitary confinement even during exercise; as a result panopticon-style structures were erected inside these yards, in which a guard post was surrounded by tiny, cell-like, one-person exercise "yards". By the end of the 19th century, these structures were removed in favour of more open - if communal - exercise yards. However, in certain prison,s such as Pentonville, in London, prisoners were required to wear masks in silent isolation, even during communal exercise. 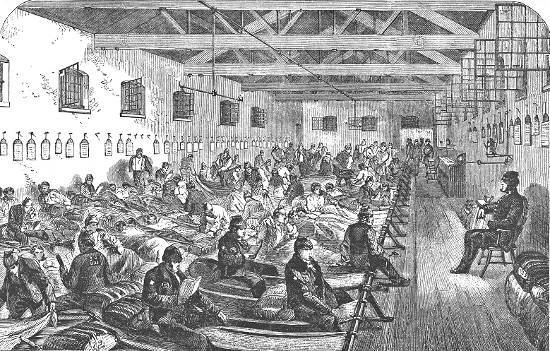 Many of these separate-system prisons from the 19th century continue to house prisoners to this day; moreover, the separate system continues to influence modern prison architecture.